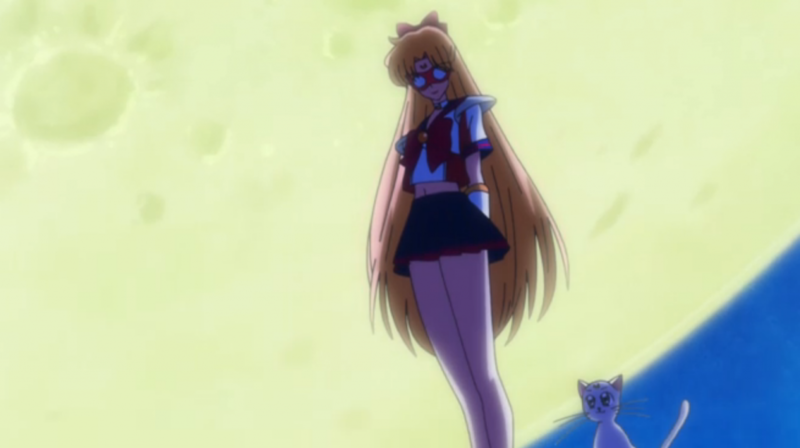 Sailor Moon Crystal Episode 6 Review | The Crystal Chronicles! 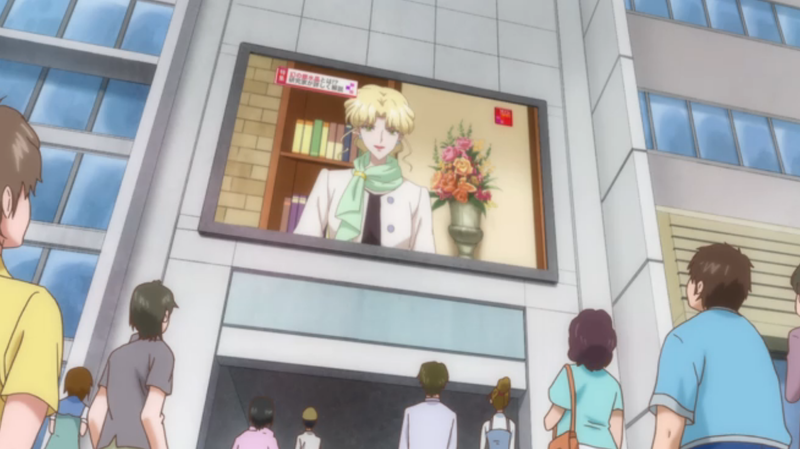 Sailor Moon Crystal Episode 6 – Tuxedo Mask. Is he a friend or foe? Committing crimes to find the Legendary Silver Crystal?! Why does he want the Silver Crystal for? Why is the title repeating itself? I guess we will know soon enough! Mamoru wakes up from a dream of a mysterious girl shouting “The Legendary Silver Crystal! !” He has been seeing this dream many times over, not understanding why this girl is telling him about the Legendary Silver Crystal. All he knows it is something important and he needs to find it soon! Usagi meets up with Makoto & Ami to walk to school together. The girls tease Usagi for arriving early, since she is usually late, but she reveals to them she has been having nightmares. She doesn’t tell them what her dreams are about, but they are similar to what Mamoru has been dreaming! Are they connected?! As Usagi thinks about her nightmare, she bumps into Mamoru! They have a cute meeting! Mamoru calls her Bun-head and tells her to be careful where she is going. Usagi blushes and gets bit angry at him for calling her Bun-head. 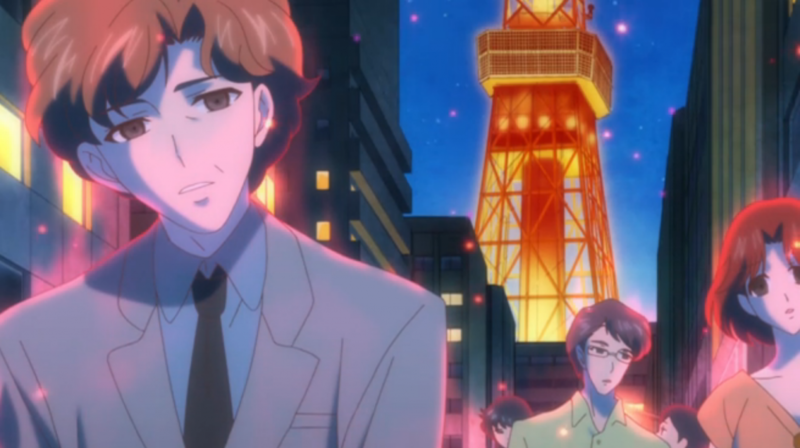 As he walks away, Makoto notices Usagi’s reaction and realizes Usagi has a crush on Mamoru! She teases her about it as Ami realizes the school he attends is an elite private school. Zoisite dressed as a woman! Meanwhile the news reports that a masked man named Tuxedo Mask has issued a statement. He is looking for the Legendary Silver Crystal. The Dark Kingdom is amused by Tuxedo Mask’s plan to find the crystal and use it to their advantage. Zoisite, the European Commander, insults Nephrite for his failure and takes over the next mission. The girls meet at the Crown Arcade after closing hours to discuss about Tuxedo Mask. How did they get inside? With the news reporting about Tuxedo Mask trying to find the Legendary Silver Crystal, they wonder if he is an enemy now. Luna explains what the Legendary Silver Crystal is, where it is from and only the Moon Princess will be able to handle its great power. Luna is from the Moon?! 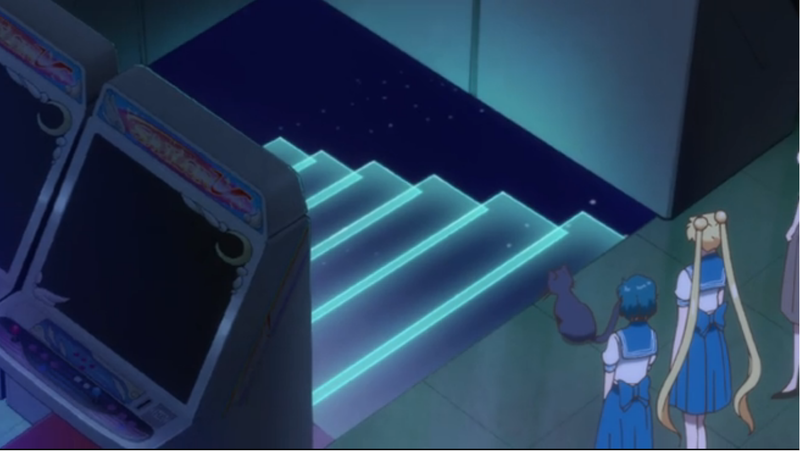 Luna shows the girls their secret headquarters, under the Sailor V arcade machine?! 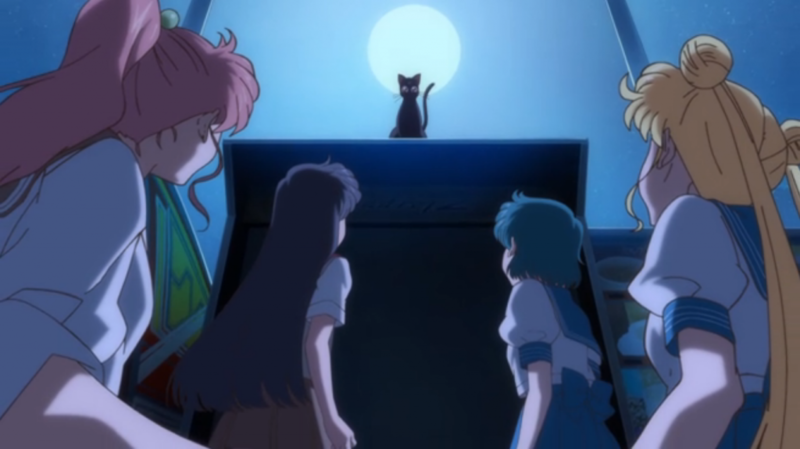 Everyone except Usagi believes Tuxedo Mask is behind this plan of controlling people in the city. Usagi believes he is a good person and runs out of their headquarters. How can he be an enemy? He saved her many times before! Zoisite’s zombies! Coming to ea…. find the Legendary Silver Crystal! Meanwhile, Zoisite has the whole city under his control. Every citizen is looking for the Silver Crystal as he is draining their energy! Rei, Ami and Makoto went to stop Zoisite plans and transform in front of him. I guess their secret identity doesn’t matter? Usagi’s energy has been drained and as she is about to fall to the ground, guess who saves her? Yep Tuxedo Mask! We learn he has healing abilities due to Usagi reviving very quickly! He apologizes to her for starting this mess, but it was not his plan to control & zap energy from the citizens of Tokyo. He tells her he doesn’t have powers like the Sailor Senshi, but wants to find the crystal. Mercury, Mars and Jupiter are in a battle with Zoisite! 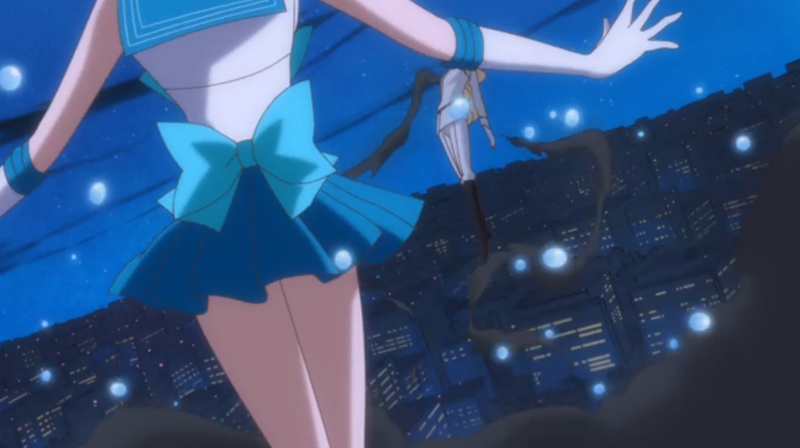 Each Sailor Senshi takes a couple of shots at him, but only Sailor Mercury was able to hit him! Even after all that fighting the girls are exhausted and fall to the ground. The clouds begin to darken and Queen Beryl for the first time reveals herself to the Sailor Senshi. Usagi sees the dark red clouds form in the sky in the distance and wants to transform to save the girls. She can’t transform in front of Tuxedo Mask, otherwise he will know who she is! He knew along and Usagi never realized that?! 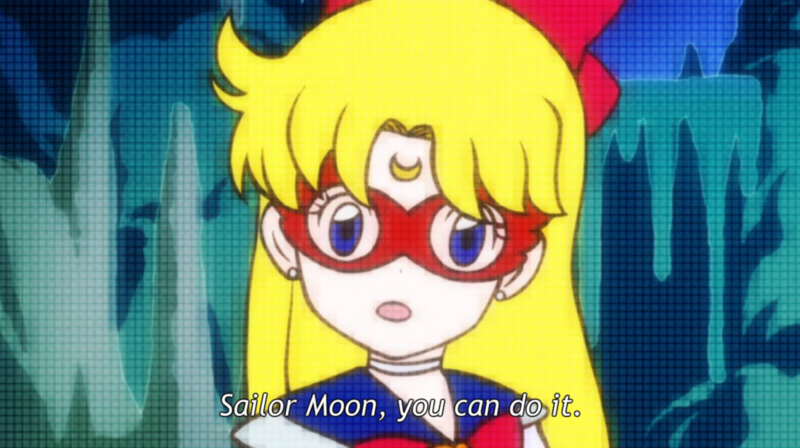 Sailor Moon doubts her powers to be able to save them, but Tuxedo Mask encourages her to go and fight. He tells her that she has the power to save them. I thought they didn’t need a prince to save them. 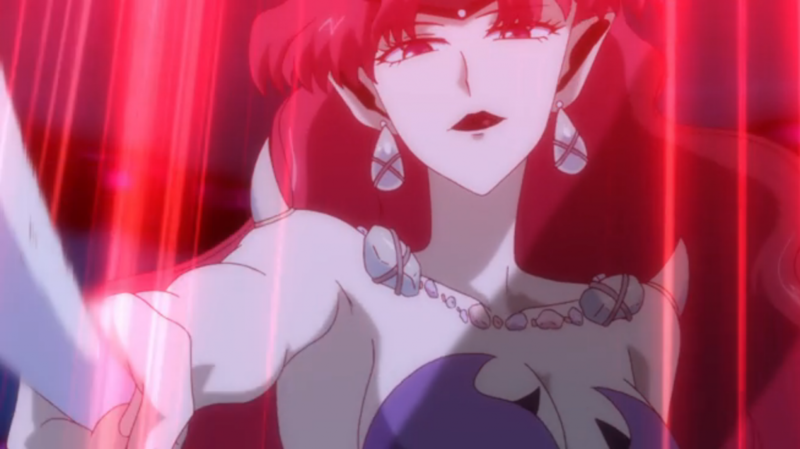 Sailor Moon arrives and confronts Queen Beryl! As Sailor Moon uses her new attack, Zoisite protects Queen Beryl and faints from her attack. They retreat back into the red clouds as Sailor Moon heals the citizens of Tokyo with her Crescent Moon wand. 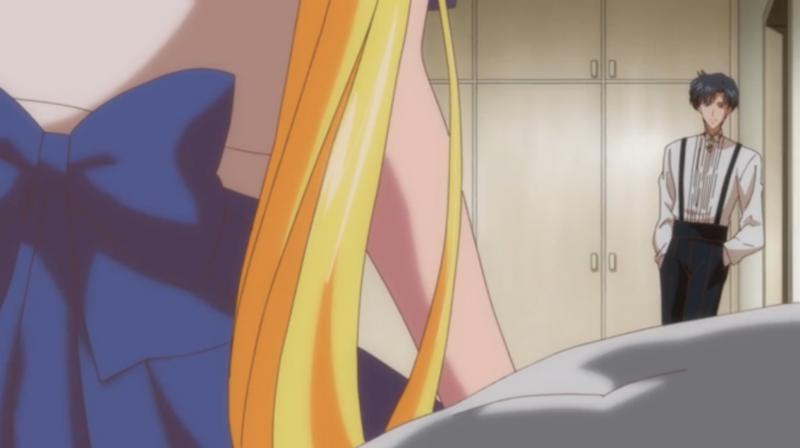 After healing everyone, Sailor Moon faints and Tuxedo Mask takes her in his arms. She feels a strong connection with him as she is falls asleep in his arms. Usagi wakes up the next day in unknown room and takes a look around. To her surprise…. Mamoru is Tuxedo Mask?! All those times they bumped into each other, teasing her and calling her Bun-head was Tuxedo Mask all along?! She was shocked! The both guys she has crushes on were the same guy! Overall this episode is pretty good. We get to see the girls be normal school girls for a while and discover that Luna had a secret headquarters for them at the Crown Arcade. We get to learn a bit more about Mamoru, the Legendary Silver Crystal, Usagi crushing on Mamoru and the big reveal that Mamoru is Tuxedo Mask! The fight scenes were amazing! No stock footage, just having the girls attack at a faster pace. Loved that Usagi thought Sailor V from the game was talking to her! She gave her encouragement and reminded her she recently received the Crescent Moon wand. You know when you have been playing too many video games, when a game character starts talking to you. 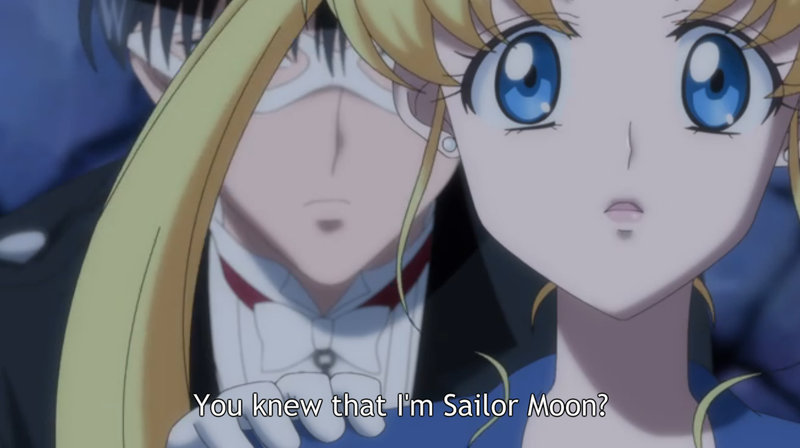 What wasn’t great about this episode is Usagi not realizing that Tuxedo Mask knew she was Sailor Moon. How can she not see that? He has been to her house to have her save a friend during the last episode. There were many signs in the past few episodes that Mamoru knew exactly who she is. The big reveal of who was Tuxedo Mask and Sailor Moon was much better written in the original anime. I do look forward to seeing the next episode! 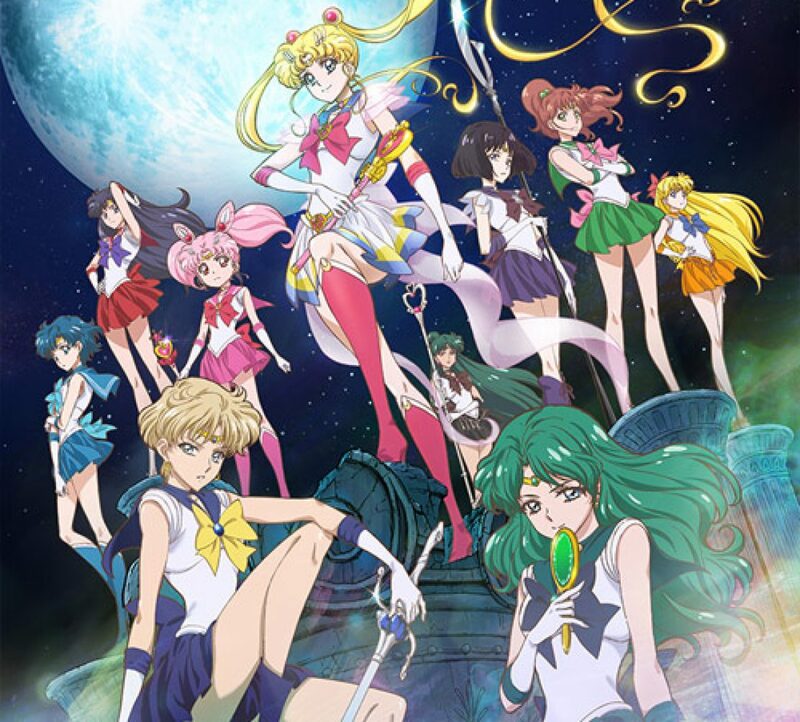 We get to learn more about Mamoru and maybe we will see this mysterious Sailor Senshi again? 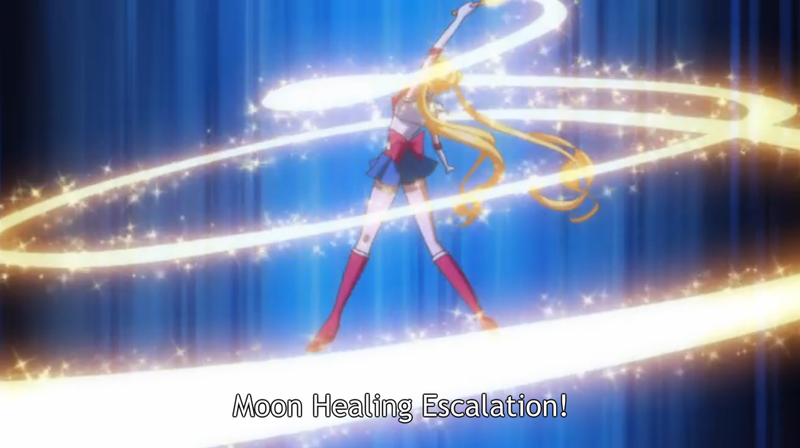 Isn’t she Sailor V? She’s real and not a game?! A new Sailor Senshi to the team?